So there have been some chatter this morning relating to the new Boss pedals debuted at Summer NAMM 2015. These two pedals are the Boss DD-500 delay and the Boss RV-6 reverb. And, these two pedals, look quite impressive. The DD-500 is a power house of a delay with many functionality / feature upgrades from the GigaDelay. I think the new enclosure look is a great new direction for Boss. The RV-6 Reverb is their answer to the awesome wave of reverb popularity that’s happening right now. As you can see, they really stepped up the plate with these two new releases. I’m assuming that we’ll have a more technical video coming out soon, but the sounds in both videos are great. Let’s talk about price. I was also impressed with this. 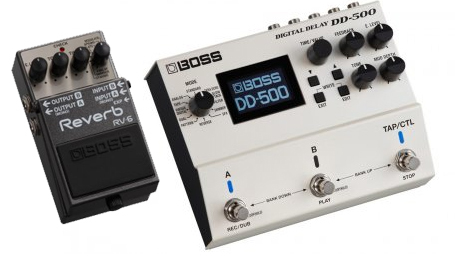 You can pre-order the Boss DD-500 for $299 and you can pre-order the Boss RV-6 for only $149. Both pedals expected to ship on 8/9/2015. Right around the corner! Let me know what you think of these pedals by commenting below! This DD500 pedal looks amazing, but I have one very important question to ask. Is this pedal a true dual delay? Meaning, can you have a dotted eight note and quarter note delay setting to play simultaneously? Much like the Strymon Timeline. It says it has a “dual delay setting”. I own the Boss DD20 Giga Delay and it has that same setting and I assure you that it is NOT a real dual delay. Basically, if this new Boss pedal can do the TRUE dual delay function like the Strymon Timeline, I will buy this right away! I looked all over Boss’s website and couldn’t find anything about this topic. I fear they are dodging that. Does anyone happen to know?